I could not recommend Ellen anymore! She did an amazing job at capturing so much from our wedding and we barely even noticed she was there! We absolutely love our video and highlights and will be watching it over and over again for years to come I’m sure! Can’t thank Ellen enough! Ellen was fabulous when filming our special day. We couldn’t be happier with the finished video that we can treasure forever. Ellen was great with all our guests especially my two little boys. If you’re looking for any video work I would 100% recommend this very talented and lovely person!!! We cannot thank you enough for the work and effort you put in for us on our wedding day. On the day your ability to pick up things that we didn’t even notice going on was superb, as well as to blend in and feel as though you were part of the wedding party. Most people didn’t even notice you there (in a good way), which in turn gave us a video full of natural scenes. You are very professional and a genuinely nice person, we were privileged to have you involved with our wedding. Also a thank you for the work you were able to do with our photographer, working together to get the best angles for both video and photography. Once we received the video we felt as though the day was being re-lived there and then. Everyone who has seen it so far has commented on your ability to bring the day to life with the perfect choice of background music. We were also amazed at how you were able to capture all the spoken parts perfectly, especially the speeches. I want to thank you so much for everything you did on the wedding day. Especially staying later (I hadn’t realised mum had asked you!)!! It was so nice to have you there on the day, it was like having a friend around! The clips look incredible, and I really can’t wait to see the full video! I know a couple of my friends have asked for your details. Thank you again, you really are a star! When you sit down to plan your wedding, a videographer is usually the first thing that hops off your list when budget is tight. Our advice…make sacrifices elsewhere as it is worth every penny. 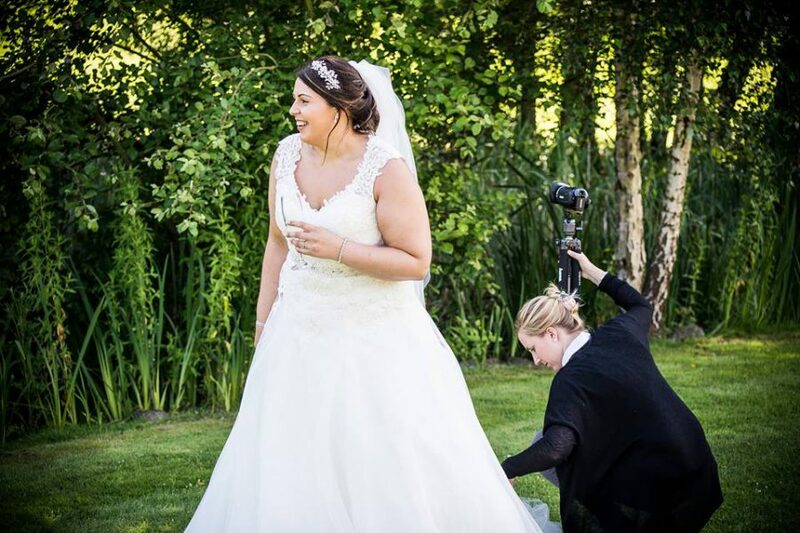 We hired Ellen for our big day in August 2014 and we can honestly say she has managed to capture our day and made it more than just a memory. Ellen was able to capture the little details, the things we missed while we were swept away during the day, the cheeky jokes shared between guests and some wonderful messages from our nearest and dearest. Above all Ellen listened (which in the world of wedding is a rarity!) she understood exactly the style and feel we wanted to go for, and put her own stamp on it for us. From our initial meeting to the final receipt of our wedding DVD, Ellen was an absolute pleasure to work with. During the day she was non-intrusive, you barely knew she was there, yet she produced the most beautiful video and highlights video we could have ever asked for. I have recommended Ellen to everyone I know – you won’t be disappointed! Thanks Ellen for doing such an amazing job. Having a videographer for our wedding day was extremely important to us and the work that Ellen has created is simply stunning. We have our whole day captured on DVD as well as a highlights video and both are beautifully presented, skilfully filmed and expertly edited to our favourite songs. If you are considering having a videographer, then look no further. Ellen is a true professional, she is creative, has a real talent in what she does and to top it off she is extremely friendly and very sweet. On our wedding day she went above and beyond her role staying a good hour or so later then anticipated due to the running over of our speeches. She was totally unobtrusive and in fact a lot of the guests didn’t realise we had even hired a videographer until after the day itself! We thank you Ellen for enabling us to see much more of the day than we had the opportunity to actually be involved in at the time! I can’t help but smile every time I watch the video, it brings all of the emotions straight back to the surface. We seriously can’t thank you enough!! We are delighted with our wedding video! Ellen Jackson has captured the day brilliantly for us, using her imagination and creativity, to give us a permanent record of our special day. We will treasure both trailer and full-length versions forever!Before the big day, Ellen listened carefully to our “brief” (and our concerns), got to know us and our chosen venue, and produced a high-quality video which completely reflects this fantastic occasion. Ellen is an intelligent, yet sensitive, professional who was totally unobtrusive during filming; we and our guests didn’t know she was there most of the time and she worked extremely well alongside our photographer who has told us that she is the best videographer he has ever had the pleasure of working with!Ellen cleverly laced the wedding formalities with charm and humour and we love the little artistic touches which make the video so “individual” to us and our guests; the choice of music, the close-ups of flowers, rings, wedding favours, the cake, unrehearsed comical incidents and so on. Although Ellen did not know the majority of our families and friends, she nevertheless manages to catch most of them on film and already we are receiving requests for more copies to be circulated and enjoyed far and wide! It is certainly a wonderful way of saying thank you to people after the event!If we ever plan another special occasion, be it a family party or similar celebration, we will not hesitate in asking Ellen Jackson to record the event for us! We would certainly recommend her to others looking for a special memento of their very special day! My husband and I, last minute, decided to hire a videographer for our wedding. The best money we could have spent! From our first meeting with Ellen we were put at ease by her polite, gentle and professional manner and she delivered just that and more on our big day. Ellen is so discreet and sweet and her presence was barely notable (which enabled everyone to be completely natural and not feel awkward around the camera). Her ability to translate all the ideas I had in mind, into a fantastic easy watching DVD is incredible. Ellen’s editing is outstanding and she provided more than we could have dreamed of in terms of video material and level of service. If you are in two minds about hiring a videographer, don’t be! Ellen will capture the most beautiful moments of which could easily be forgotten or missed. 5 out of 5 star review. Having Ellen with us on our wedding day was one of the most valuable decisions we made. She was truly a pleasure to have around and the final DVD has had us laughing out loud as well as an emotional tear or two! A wonderful, precious keepsake for many years to come! Ellen did the most wonderful job with our wedding video going far and beyond what was expected. She was professional, efficient and somehow managed to capture those moments up-close from a distance (still surprised how). We are thrilled with her communication and would highly recommend her to anyone for any occasion. Thanks again we truly love the video!! !